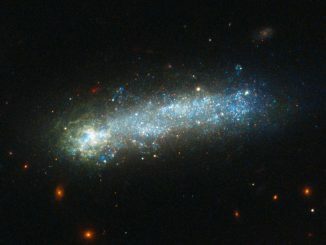 This image, captured by the Hubble Space Telescope’s Wide Field Camera 3, shows a galaxy named UGC 6093. 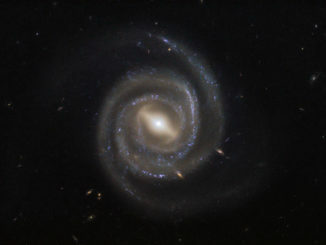 As can be easily seen, UGC 6093 is something known as a barred spiral galaxy — it has beautiful arms that swirl outwards from a bar slicing through the galaxy’s center. 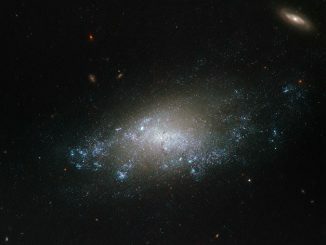 This image of the spiral galaxy NGC 3274 comes courtesy of the NASA/ESA Hubble Space Telescope’s Wide Field Camera 3 (WFC3). 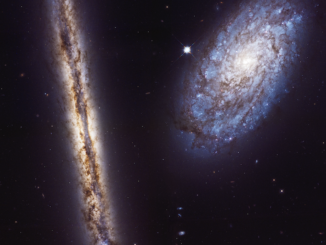 Hubble’s WFC3 vision spreads from the ultraviolet light through to the near infrared, allowing astronomers to study a wide range of targets, from nearby star formation through to galaxies in the most remote regions of the cosmos. Several thousand years ago, a star some 160,000 light-years away from us exploded, scattering stellar shrapnel across the sky. The aftermath of this Type Ia supernova is shown here in this striking image from the NASA/ESA Hubble Space Telescope. The exploding star was a white dwarf located in the Large Magellanic Cloud, a close neighbouring galaxy. 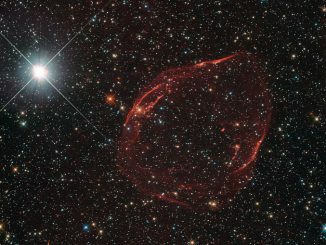 This NASA/ESA Hubble Space Telescope image captures the remnants of a long-dead star. 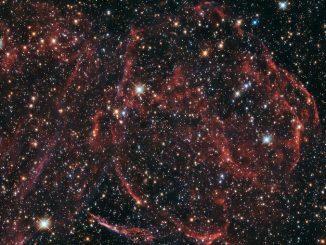 These rippling wisps of ionised gas, named DEM L316A, are the remains of an especially energetic Type Ia supernova located some 160,000 light-years away within one of the Milky Way’s closest galactic neighbours — the Large Magellanic Cloud (LMC). Astronomers using the NASA/ESA Hubble Space Telescope have conducted the first search for atmospheres around temperate, Earth-sized planets beyond our solar system. 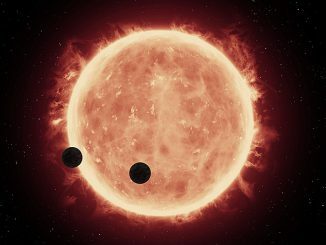 They found indications that increase the chances of habitability on two exoplanets known as TRAPPIST-1b and TRAPPIST-1c orbiting a red dwarf star approximately 40 light-years away. This new image from the NASA/ESA Hubble Space Telescope shows a cosmic tadpole, with its bright head and elongated tail, wriggling through the inky black pool of space. Tadpole galaxies are rare and difficult to find in the local universe. This striking example, named LEDA 36252, was explored as part of a Hubble study into their mysterious properties — with interesting results. Water is a hot topic in the study of exoplanets, including “hot Jupiters” close to their parent stars that can reach a scorching 1,100 °C, meaning any water they host would take the form of vapour. Hot Jupiters have been found with water in their atmospheres, but others appear to have none. 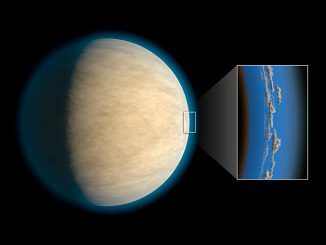 NASA scientists wanted to find out what the atmospheres of these giant worlds have in common. 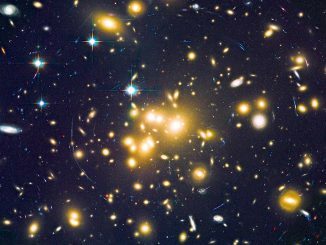 When Edwin Hubble discovered nearly 100 years ago that the universe was uniformly expanding in all directions, the finding was a big surprise. 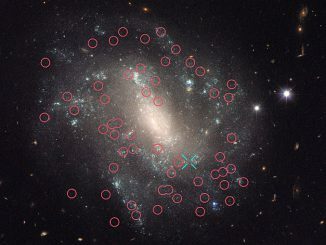 Then, in the mid-1990s, another shocker occurred: astronomers found that the expansion rate was accelerating, perhaps due to “dark energy.” Now, the latest measurements of our runaway universe suggest that it is expanding faster than astronomers thought.